Di.Gi.Emme has been operating in the fields of cold metal stamping and transfer technology since 1974. We design and produce turn-key transfer systems and lines, toolings, mechanical and servo transfers, mechanical and servo presses and feeding systems for any industry. 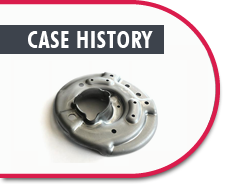 We also provide presswork services, including the manufacture of the finished component. The continuous evolution of the market has led us to produce extremely high-quality equipment and components and to explore new paths. Thus, we are able to meet our customers’ needs and to supply the best technical solutions – so as to optimize the production, reducing the time, the labor, and the material consumption. Over the years we have developed close-knit relationships with highly qualified partners. In this way, we have created a network of suppliers that enables us to challenge demanding projects. Thanks to these solid partnerships, we are able to guarantee our customers consistent, high-quality and cost-effective solutions.